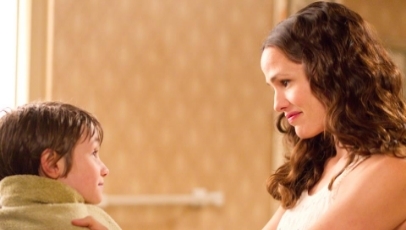 Cindy (Jennifer Garner) and Jim (Joel Edgerton) are desperate to be parents. However, when they’re told by their doctor that this won’t happen naturally, they decide to indulge their dreams one final time by burying a box in their back garden filled with all the personality traits their ideal child would bear – kind, honest to a fault and musical, to name a few. Overnight, a magical storm occurs and Timothy (CJ Adams), a young boy with leaves on his ankles, is thrust into Cindy and Jim’s life. Dreamt up by actor Ahmet Zappa and written and directed by Peter Hedges, The Odd Life Of Timothy Green immediately asks you to suspend your deepest beliefs and simply accept its desire to be a warm-hearted family-orientated fable. This would be possible if everything about its mere concept, let alone its scorched execution, wasn’t so downright disturbing. It’s baffling to comprehend how a film like this is supposed to appeal to anyone, let alone its target audience of family’s hoping for a mid-afternoon escape. It’s well-meaning, yes, but it’s so sickly sentimental and bolstered by increasingly ridiculous subplots (Cindy and Jim are lead to invent a new type of pencil by Timothy’s overwhelming belief in them, while Timothy strikes up an unsettling romance with Joni, played by Chloe Moretz-lookalike Odeya Rush) that it alienates its audience the more the narrative unspools. It’s difficult, too, to engage with the characters as they’re concocted in such a way that makes them incredibly one note and stereotypical. Furthermore, Hedges’ direction is so clinical and twinkling that even in those brief moments where the script delves into darker territory, such as its explorations of both infertility and death, it sadly doesn’t have the guts to go the full whack, scrambling back to easier, less taxing terrain. It’s all soundtracked to shuddersome effect by Geoff Zanelli’s cloying musical accompaniments. In fact, the only winner here is Edgerton, who escapes by the skin of his teeth and mostly because the worst dialogue is awarded to Garner. Walt Disney Pictures are notoriously inconsistent when it comes to their live-action family fare. For every successful Enchanted or The Muppets, there’s a Sorceror’s Apprentice, or even a Secretariat. The Odd Life Of Timothy Green, however, finds Disney at an altogether new low, capped off by a cringeworthy dance sequence that will make you, assuming you haven’t already done so, scream for Timothy to crawl back into his magical hole. I agree with you, but, I’m gonna rescue the cinematography aspect, the movie has beautiful visuals and good art direction.